"This tastes just like hot chicken wings, but without the mess. It is very addicting, and is perfect for football and tailgating season. Serve with tortilla chips. I take this whenever I have to bring a dish and am always asked for the recipe." In a medium bowl, stir together the cream cheese and hot pepper sauce until well blended. Mix in the Ranch dressing, chicken and Cheddar cheese. Spread into a 9x13 inch baking dish. 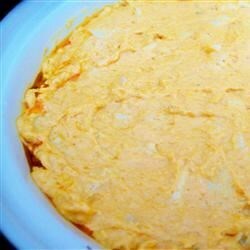 Here's a creamy baked dip that tastes just like Buffalo chicken wings! Entirely too twangy. I would cut back on the ranch. It was just too much when combined with the cream cheese.